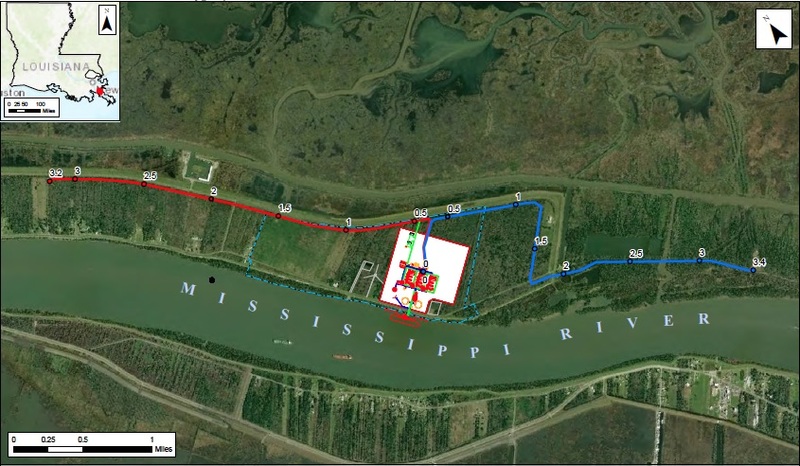 Pointe LNG has chosen a 600-acre site which showed no significant environmental impacts through the FERC Process in a previous filing. A Modular build-out design will enable accelerated liquefaction and delivery to customers, and offers an opportunity to leverage Pointe LNG’s oversized storage tanks and dock for possible future growth. The Anticipated costs for 6 MTPA is estimated at $535 per ton. Our location on the East Bank of the Mississippi River (Left Descending Bank) at Mile Mark 46 above Head of Passes (AHP) gives our customers access to liquid natural gas markets on existing pipelines with open firm capacity to America's most prolific supply basins. At MM 46 AHP, expected river transit with pilot on board is 6 hours. This is similar to most river transits to existing LNG terminals in Sabine Pass and Lake Charles. 320,000 m3 of storage capacity in two tanks. Available water depth at the berth is in excess of 65 feet, which provides the ability to safely moor vessels up to 270,000 m3.